RSW – Rama Swiss Watch – is an intrepid watch company that openly explores new concepts and shapes to create original-looking wristwatches. This approach is true even of the company’s dressier offerings, but especially evident of the watches in its Modern Contemporary collection including the popular Outland. One need only look as far as the RSW crank-crown winding system for a taste of the brand’s design aesthetic: the patented system is original and unusual. To operate the crank-crown on the Outland, the user pulls out the entire adjunct as if pulling out a standard crown. The lower portion then folds up so that the mechanism appears and functions as a handle, or crank, by which to wind the watch and adjust the time. This version of the Outland uses the theme of a compass display to indicate time. 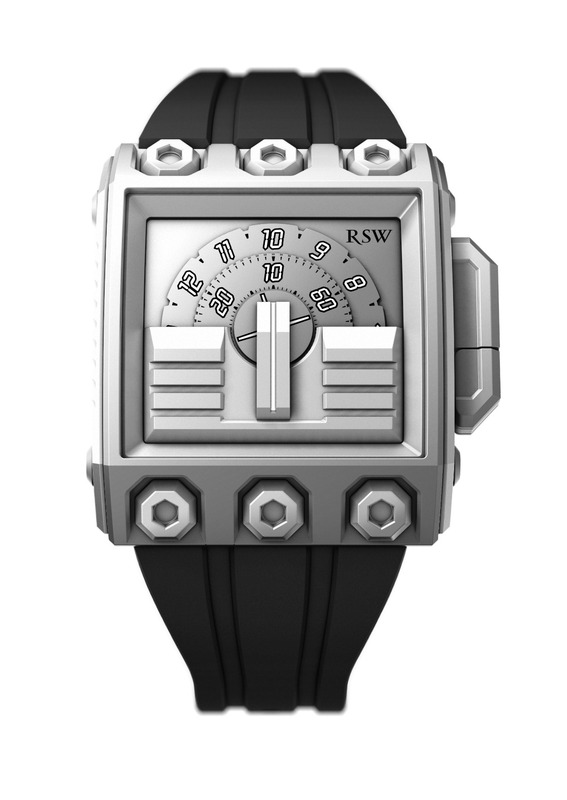 RSW’s website also describes the Outland as a watch that “pays homage to futurism, oblique architecture, the super computers and the first electronic musical instruments.” While this description is somewhat abstruse, it does reveal the general sense of industrial futurism that the Outland encompasses. The substantial Outland case is made of 316L stainless steel and measures 52 mm high, by 44 mm wide and 12 mm thick. It has the appearance of an engine block with three cylinders at the top and bottom, each housing an octagonal rivet. A dial cover over the lower half of the dial further emphasizes these industrial principles. Its design is symmetrical, balanced and resembles a portion of a keyboard, perhaps referring to the aforementioned “first electronic musical instruments,” many of which were keyboard-based. Regardless of these visual and thematic aspects, the dial cover plays an important role in the watch’s functionality. First, it covers the lower half of the hour and minute wheels to ease the clarity of the readout; second, it provides the stationary “hand” used to read the time. The hand, in this case, refers to the white stripe in the middle of the vertical bar at the center of the dial, which is the intersect point of the turning wheels and where to look to read the time. For example, when the 10 on the outer topmost wheel (the hour) and the 10 on the middle wheel (the minute) are both directly above the white hand, the time is 10:10. The small inner wheel without numerals displays the seconds. All three wheels turn clockwise. This method of telling time – with wheels circling a stationary hand – is analogue as opposed to digital, even though the display is somewhat abstract and the numerals are displayed using a “digital” font. The caseback upholds the industrial and futuristic theme of the watch with its slim, enigmatic rectangular window… peer in for a glimpse of the Outland’s Swiss made automatic movement. Eight flathead screws secure the caseback to the case, which is water resistant to a maximum of 330 feet. The Outland is mounted on a black rubber strap. Futuristic design, nods to earlier invention and an uncommon time display – the Outland is an original watch to own, wear and talk about. 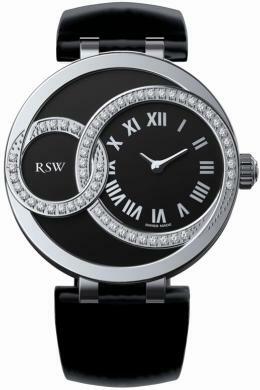 The classic elegance of the RSW Consort is something that is appreciated in every time zone. The clean lines, functional dual time zone dials, and effortless beauty of this watch has universal appeal for watch aficionados around the world. Instead of a second hour hand like many dual time watches, the Consort has an independently set second dial at the nine o’clock position. Both the traveler’s departure and destination times zones are clearly delineated, and with the use of this smaller, subordinate dial, there is never any question about which dial is showing local time. There is also an easy-to-read big date display at the six o’clock position, along with a small continuous second hand. You’d expect this perfectly proportioned timepiece to have something equally appealing on the inside, and it does. A precision Swiss made ETA 902 movement powers the watch, while a scratch resistant sapphire crystal and rugged stainless steel case protect it. 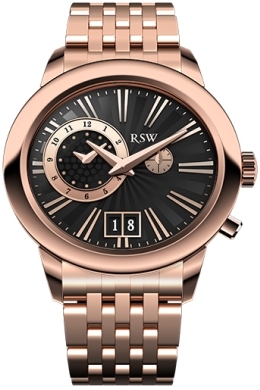 The RSW Consort Collection is available in a variety of finishes, including solid stainless steel, rose gold PVD, and stainless steel set with up to 74 diamonds. The Consort Black Dial Oval Watch comes equipped with your choice of a matching stainless steel bracelet or fine leather strap. If you’re a worldly person with a love for travel, you’re going to want to make the RSW Consort a permanent part of your travel plans. To acquire one of these classically beautiful creations, contact an authorized RSW dealer today. The RSW Crossroads Black Dial Automatic: The architectural “open heart” design provides a window into the soul of a fine timepiece. The innovative design of the RSW Crossroads provides watch connoisseurs with a delight to the senses that will appeal to almost anyone who appreciates beautiful objects. This boldly masculine 46mm watch possesses a distinctly architectural quality with its unique “split” design that elegantly reveals the inner workings of the precision Swiss mechanical movement within. Unlike many skeletonized watches, the Crossroads Black Dial Automatic is a true work of art. The sophisticated dial with its deeply carved interlocking rose gold circles has been split and then offset vertically to reveal the movement inside. Just enough of the mechanism is visible to fascinate the wearer, without destroying the cohesive, architectural look of the watch itself. This fine timepiece is powered by a precision Swiss RSW 1110-VB automatic movement. The massive stainless steel case is water resistant to 10 ATM, while the sapphire crystal is resistant to virtually all scratches. An asymmetrical protected crown completes the design and allows you to easily set the three-hand display. The durable stainless steel case of this fabulous watch has received a dramatic matte black PVD coating and the watch is equipped with a matching black PVD bracelet. Watches in the Crossroads Collection are also available in a variety of finishes, including solid stainless steel, rose gold PVD, and stainless steel set with diamonds. The RSW Crossroads makes a strong statement. It’s definitely a watch for a man who knows his own mind. If you’re this type of individual, it might be time to acquire a Crossroads timepiece of your own. 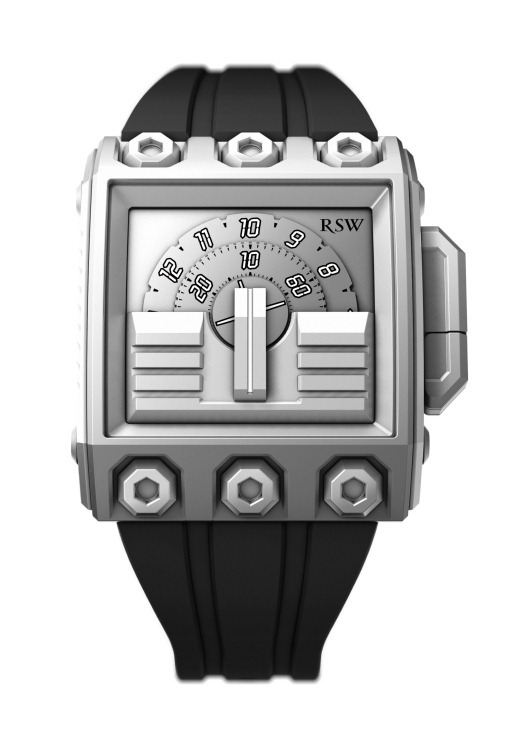 To purchase one of these bold and beautiful designed timepieces for yourself, contact an authorized RSW dealer today. When it’s on your wrist, it’s poetry in motion. The Wonderland Round Collection from RSW exemplifies what sets this brand apart from the pack. The Wonderland isn’t just another timepiece; it’s fine jewelry. The distinctive round case with its delicate carved bezel of interlocking circles is simply exquisite. Both the classic stainless steel version of this uniquely elegant timepiece and the elite diamond studded glamor model make a sophisticated statement in any setting. The dial is large and bold enough to function as a fashion-forward sports watch, while the sensuous lines and exquisite detailing are dressy enough for your most elegant occasions. Wonderland Round watches are available in a variety of finishes, including solid stainless steel, rose gold PVD, and stainless steel set with diamonds. Wonderland models can be equipped with your choice of fine leather, or genuine Alligator straps. Alternately, most models can be obtained with a matching stainless steel bracelet, if desired. Each watch is water resistant to 3 ATM and features a scratch resistant sapphire crystal. Powering this uniquely individual timepiece is a precision Swiss ETA quartz movement that will provide years of reliable service. RSW watches aren’t for everyone. 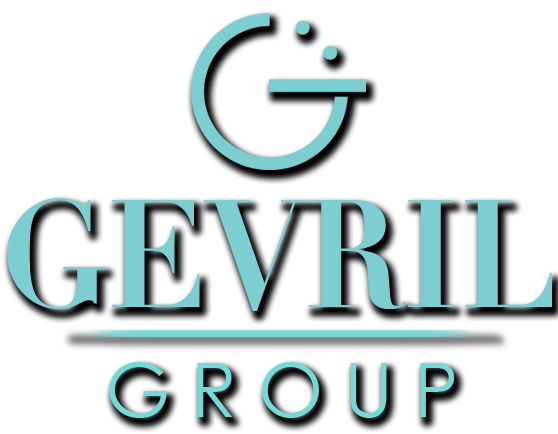 The company is proud of creating a stylistic personality that is truly unique. If you feel like you are just as unique yourself, you’re going to want a Wonderland watch on your wrist very soon. To acquire one of these artfully designed timepieces for yourself, contact an authorized RSW dealer today.